883 ft from a set of two 10-watt lights! All LED Lights are not created equal. The best value and longest distance LED lights are here. Please check out the install and programing videos at the bottom of this page. 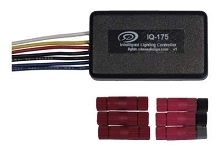 The best Value and Long Range performance available in auxiliary lighting. Don't fall victim to overpriced high lumen rated, low performing lights. Put the light where you need it, not in the tree tops. 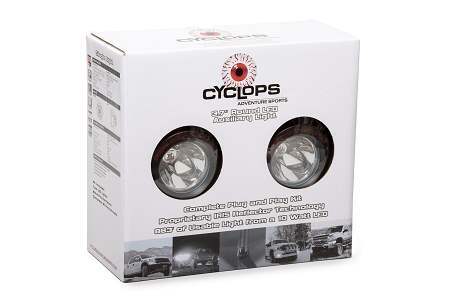 No other LED light matches the long range performance of the Cyclops Long Range series. All Cyclops long range lights come with unbreakable polycarbonate lenses. Why Optimus? The Long Range Optimus Series are LED Driving Lights, advancing lighting technology to the next level. Utilizing an all new proprietary IRIS Reflector Technology, the Long Range series provides the ultimate focus for long range lighting by producing 883 ft. of usable light from a single 3.5" tall, 10-watt LED. 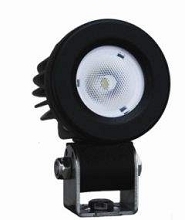 Compared to a standard 55 watt low beam headlight reach of 88 ft. and a standard 65 watt high beam reach of 153 ft.
Optimus lights also feature Cyclops Prime Drive technology for integrated thermal management and dimming capabilities. Now available are Filters for the Long Range Round Lights. These drastically change the beam pattern and offer a tunable lighting solution. You can run one wide angle filter and one spot, or two wide beam pattern filters. Mix or match for a very tunable system. Amber filters are great for fog or adverse conditions as well making a huge difference with conspicuous lighting. Choose the light beam pattern and if you want dimming or non dimming harnesses. Cyclops products have very high quality wire harnesses. Several versions are available to suite your needs. The Skene dimmer option offers the user several different operating levels from 0 to 100% in 10% increments. With the Skene unit you can use your existing headlight switch to operate the high and low beam with no other switches required, chose the single pole handle bar switch option if you would like to turn the lights completely off while riding. 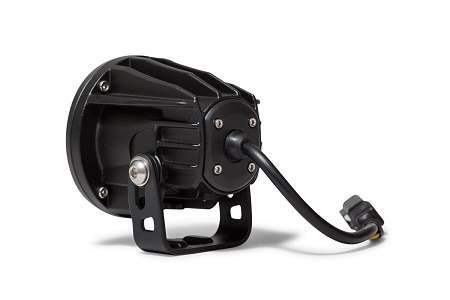 Note that on the 2013/16 BMW R1200GS as well as 2018 and newer KTM1290R and S with the factory LED headlight require the Cyclops Raider Canbus interface in order to get dimming features, the skene is not used on these bikes.. KTM version to be available in early March. The new Long Range Optimus Prime doesn't sacrifice light output to achieve an ultra-compact housing. Actually the opposite. The Optimus Prime outperforms traditional Halogen Off Road Lighting solutions in both distance and output, all while fitting within a housing that doesn't look bulky and in the way. So put away the huge, awkward looking lights, and get the driving lights that will amaze you every time you light them up. The Single Long Range Optimus Prime throws 1 lux of light 883 feet. 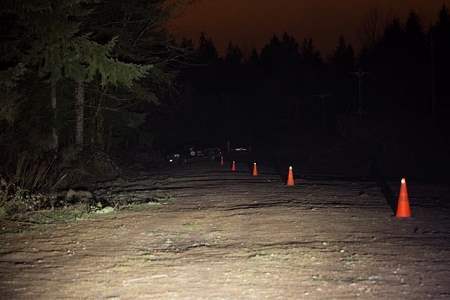 For comparison, a motorcycle headlight low beam measures 1 lux at 88 feet, and high beam 1 lux at 153 feet. The Optimus Prime is truly "lighting evolved". Prime Drive The More Powerful and Long Lasting LED The Optimus Prime with Prime Drive drives the LED more efficiently while managing heat levels. This means more light from the LED and a longer lifespan. This is advanced LED technology in action. Electronic Thermal Management ETM monitors the heat output of the LEDs and makes use of integrated Pulse Width Modulation circuitry in order to maintain safe operating temperatures in order to prolong the LED life span to its full 50,000 hour potential. I bought these lights based on reviews of the product. I work 12 hour shifts and end up driving in the dark at both ends. 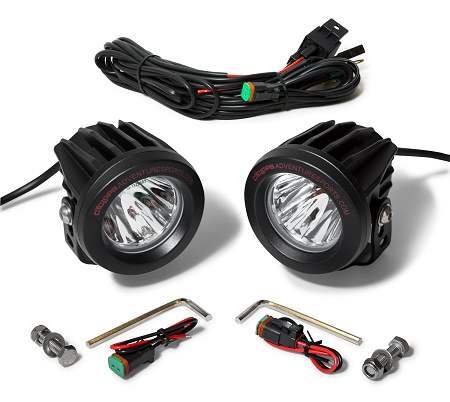 These lights are fantastic, I leave them at 50% at low beam and when I switch to Hi-Beam. WOW. I can see well enough to overcome any moonless night. I had a small issue with the lights not dimming and called their customer service and spoke with Gregg. He spent a crazy amount of time with me on the phone trying to trouble shoot the issue, calling me back no less then 5 times in an attempt to make this right. In the end the lights were just bad and so replaced. I would buy from them again and highly recommend the product and the customer service. Shipping was super fast too. Daryl, and Greg are great to work with. When I first installed the lights, they didn't dim correctly and they sent me a new dimmer right away. I subsequently found out the problem was my fault and offered to pay for the second dimmer and they refused and said to just ship it back to them. As far as the lights themselves....AWESOME! On full power reflective signs light up from a quarter mile away. Visibility is tremendous. You can custom dim them to about 60% and then on low not get flashed by oncoming drivers. Best safety devices on my GS. After purchasing a new Gs1200 I was in the market for some LED Aux lights. On my previous 1200 I was running ADV Monster M60's These put out a lot of light but lacked the long range lighting I was looking for. After reading threw the ADV Rider forum, I called Cyclops. It was immediately obvious that the folks at Cyclops have both passion and experience. I settled in on a set of 10 degree Long Range lights with the wide beam filters and skene dimmer. The install was very easy with good directions, the product was plug and play with high quality water proof connectors and components. 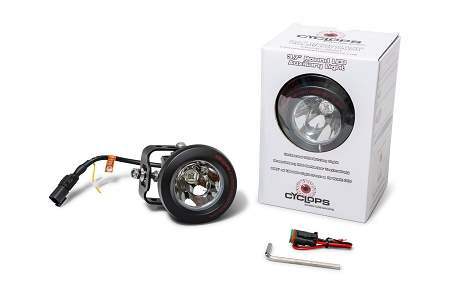 The performance of the lights is outstanding, unlike the model 60's that blow light everywhere, the Cyclops lights are extremely well focused and provide a much better beam pattern than my previous lights. The build quality is exceptional. I will be back for more Cyclops products in the future. I just installed a set of these on a 1996 BMW R1100RT, I built an adapter to mount them to the top caliper bolt and they fit perfectly. One of the most impressive wiring harnesses I have ever worked with. Very high quality connectors at every point. It looks like a mil spec harness. Thanks again Darryl. I installed on a 2006 BMW 1200GS. Daryl recommended the 10 degree spots, with wide light filters. These work great. Without the filters, you can see things so far away that you can pull in the clutch and coast and get your speed down - no need for panic braking when things on the road pop into view. And the wide filters work very well; they take away some range, but light up the sides much better for seeing animals heading toward the road when driving around the speed limit. Super quality wiring as well. Took longer than I expected to install, but so glad I did. Two months after installation the weather finally thawed, it rained the salt and slush off the roads, and I finally rode through a nearby park with no artificial lights. 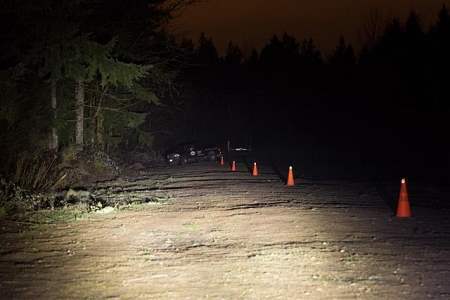 These lights were purchased to broaden the overall headlight beams as far out to the side as one continuous main band would allow, mainly for an Alaska wander coming up in July. 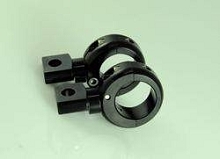 The skene dimmer and snap-on lense covers, together, are what made this the kit to buy. Brightness as well. And the ability to easily adjust both angles independently. (This for a 2018 KTM 1090 Adv R.) The dimmer is just brilliant. Nothing to add and wire up to the bars, a great innovation. Imagine the scenarios, day, night, and weather. Before leaving on the night ride I parked level in front of the garage door and spread the beams per previous intention. The clear broad-beam lens covers were snapped in place for oncoming, low beam set to 50%, and had previously installed the Cyclops LED headlight bulbs (which are quite spectacular). Entering the canyon was well more than I had expected, the three low beams together. The spread and brightness are, well, relaxing I guess. It's no longer a tunnel view; it"s more like driving up to home plate under lights. A piece of straight road came up and I flicked on the high beam. And then commenced laughing in my helmet. Flick them off for a few seconds, flip back on, laugh stupidly. Repeat. Aux light amusement. Oh yes, also - the install: I suppose I was glad to be an old goat who'd fiddled with things most his life. I took some time to think it over, once I got all the stuff torn off the bike and had studied the harness and spread it out. I think it took parts of 3-4 days, did a re-route of a few wires early on, had to buy some connecters and a better crimp tool for a charging port side job in the headlight cavity. Kind of a fun challenge in dead winter. On this bike there is a nice place to park the skein electronic unit in a small frame cavern behind the triple tree. It took a little doing, be patient, have fun. They'll help you on the phone, I did check.